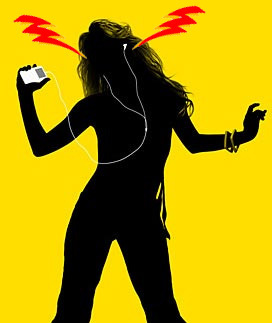 Your iPod Is Making You Deaf... - Lean It UP! Did you know that there’s no such thing as age-related hearing loss? 85 dBs is considered the threshold of what humans can safely listen to without experiencing any sort of hearing damage. What’s really interesting is that an iPod blasting at maximum volume can reach dB levels upwards of 120 dBs!! That’s ridiculously loud to begin with, but what makes it even worse is that earbuds pump sound directly down your ear canal at a point-blank range. All of that bass blasting constantly can have a pretty nasty impact on your hearing in the long run. According to the National Institute for Occupational Safety and Health’s (NIOSH) guidelines for sound exposure, listening to an iPod at max volume (120 dBs) is never safe, not even for a few seconds. If you’re like me and love to blast music during an intense workout, it’s pretty alarming just how much damage it’s been doing over the years. According to CBC News “a typical person can safely listen to an iPod for 4.6 hours per day at 70 per cent volume using stock earphones.” Personally, I’d like to be able to hear 50 years down the road. If you listen to your iPod set a volume limit to ~70% of the max volume. By doing that you’re keeping the max dBs to 84–safely below the threshold of hearing damage.